Being home to 1600 islands that are dotted with gorgeous wind- and wave-eroded grottoes, Halong Bay is an awe-inspiring collection of looming limestone karsts and picturesque isles rising from the emerald sea in northeast Vietnam. 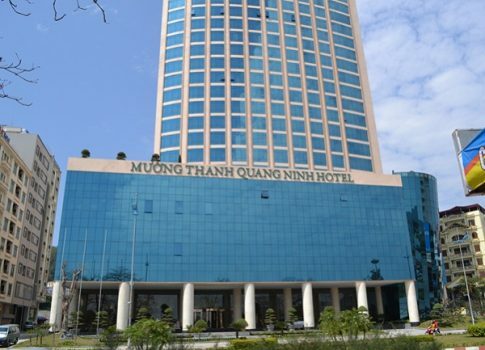 Day and overnight boat cruises, sandy beach escapes, ancient cave exploration and kayaking tours are the best ways to explore Image Halong Bay in Vietnam. Even though for most travelers to Halong Bay, taking a junk boat cruise might be the top choice, kayaking, which offers a unique viewpoint, as you paddle between towering karst cliffs, coastal caves and rocky isles, is a more adventurous way to take in the sights. Thanks to this bay’s thousands of islands, the calm water, the fine current and the not too strong wind, the conditions for sea kayaking are ideal. When your cruise parks next to the village, joining freely kayaking or swimming between the blue water is the most exciting and fascinating thing. It is the wondrous beauty of nature through fun and unique images of thousands of colorful caves with stalactites and limestone islands in Halong Bay that has enchanted a large number of travelers. 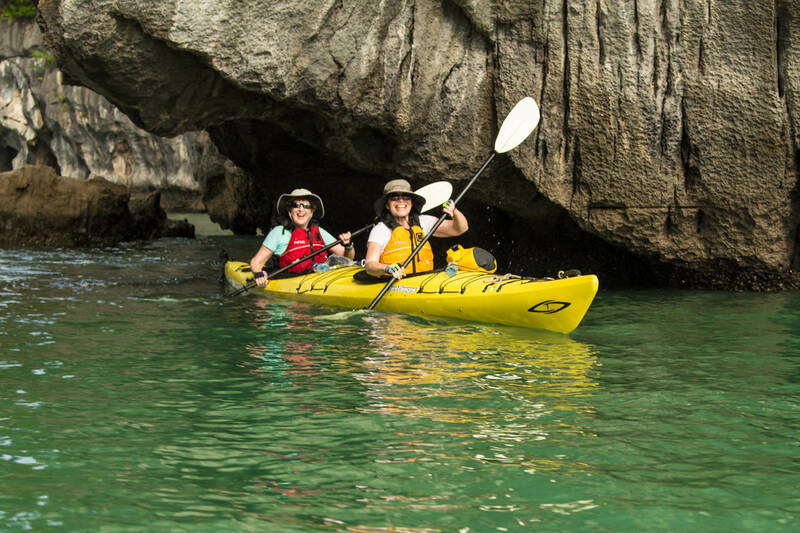 To feel all the grandeur of Halong nature and touch thousand-year-old stalactites or watch birds on the cliffs or discover cliffs below the waves rolling up thousands of years, kayaking is the best way. If you cannot swim, can you ride a tiny kayak between immense waves? Don’t worry! It is not a big problem. With the specific instructions of the guides you will see that the sailing becomes extremely simple and attractive. There are 2 people on each kayak. Initially the kayak may not move according to the operator, but it is very interesting in kayaking to admire the limestone islands, visit fishing villages and learn works of fishermen on the sea at a really close distance after you have mastered the oars. 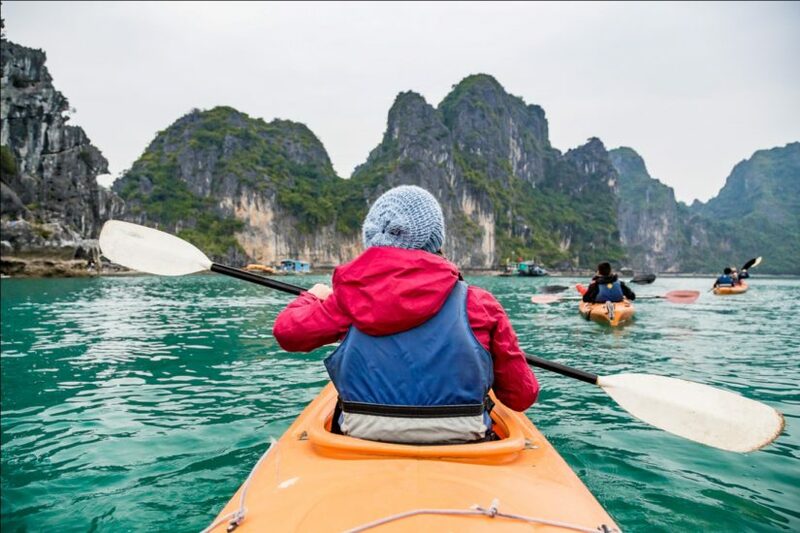 When going to Halong Bay, one of the favorite activities of travelers is taking a kayak paddle closely the foot of rocks to discover new emotions. While the kayak is going through the unnamed islands, you can get an opportunity to see the tiny fishes swimming and dancing around, admire the beauty of coral reefs as well as other exciting scenery. 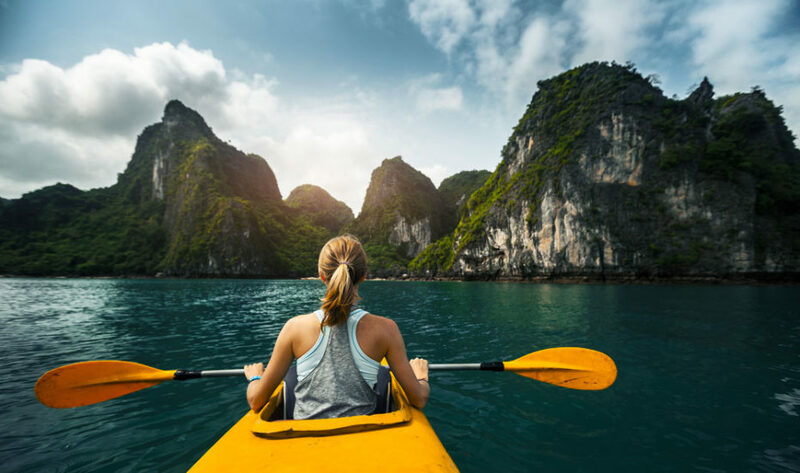 Experiencing kayaking around some islands like rugged Dau Be and Cat Ba Island and you will have a treasure trove of memories to last your lifetime. Cat Ba, which is the biggest island in this area, offers some wonderful beaches as well as stirring jungle scenery. 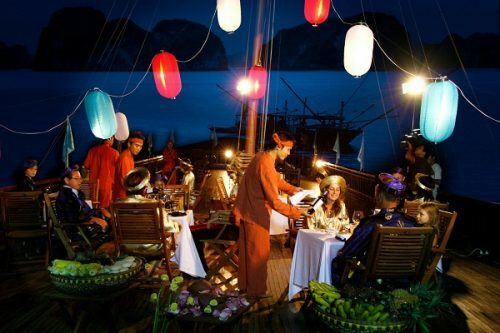 Most time of the year, the laid-back place of Cat Ba Town is an excellent base for many interesting activities around the island, or kayaking and sailing around Lan Ha Bay. On a kayaking tour, travelers can live as fisherman to discover original culture of fish village on Halong Bay and know more about the life of Halong’s fishermen. Many travelers prefer kayaking with their friends to Van Chai Co-operative, Cua Van, Ba Hang, Vung Vieng, fishing village, etc to closely see the daily activities of fishermen, from the way they cook food on boat to the way of making the fishing-nets and feeding fish. You can enjoy kayak rental service at Halong tourist wharf. There are currently many types of kayak made of plastic composite, molded rubber or inflatable boat with oars. 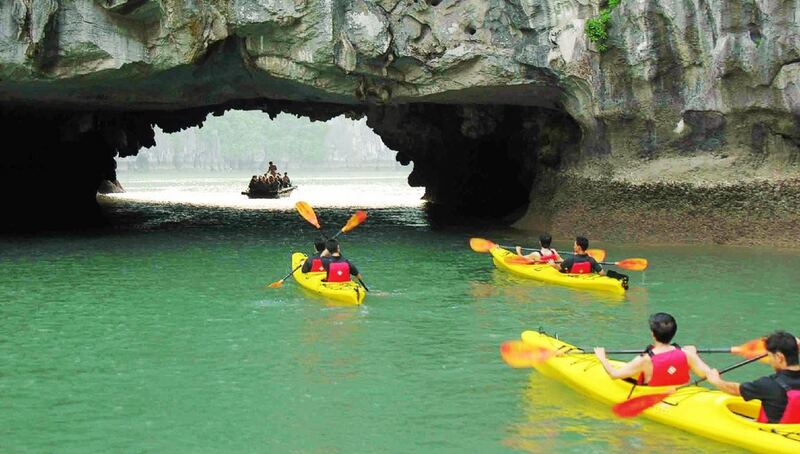 The appropriate places for kayaking are: Co Cave, Ba Ham, Luon Cave, Three Peach, Dau Be, etc. If you want to experience kayaking in Halong Bay, you can choose cruise tours with luxury yachts. Part of the cruise tours on Halong Bay, this interesting activity is for those who want to explore the charm of Halong Bay. 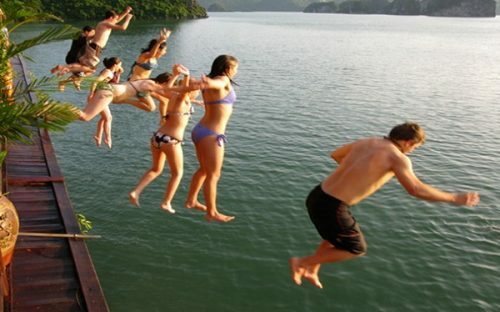 To enjoy this exciting feeling, let’s take a self-boating!